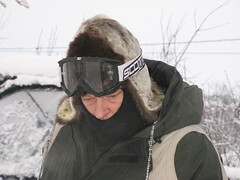 Tom is wearing his new seal skin and otter (inside) hat. This is a traditional Yupik hat called a Malaggaayat. A craftswoman from Tuntutuliak made the hat for him. We met her at the Saturday Market and the hats she had were too small. Tom wanted otter instead of beaver too. So she measured his size with her fingers. The Yupik have a very sophisticated measuring system that utilizes their hands, fingers and arms. The hat kept Tom warm on our snow machine ride to Brown’s Slough. Tom is trapping black fish for ice fishing out there.I went with him and got to help him free the 3 muskrats that got caught in the black fish (minnow) trap. They were cute, but mad at Tom and tried to feebly attack him. They ran off and watched us from under the ice. I got to drive the snow go home across the slough and the river. My hands got cold even with the heated handle bars. I think a pair of beaver mittens are in my future. Wow looks like a warm hat. I guess here in Minneapolis it is not that bad at 8 degrees. We went to the downtown holidazzle pararde with the kids. They thought that was the coldest they have ever been. Maybe a couple of days in Bethel will toughen them up. They are truly city kids. SO is the hat as warm as it looks? Hope you all are having a good Christmas!! It’s been -19, better get whatever mittens you think will work..How’s the breathing in of that air?? Amazed that the sled dogs don’t look like they could take that cold weather….Too short haired?//Are many like that? Hey- what a great hat! !